It was the creation of the original tundra vehicle, the Tundra Buggy, that ignited adventuring amongst polar bears in Churchill more than 30 years ago. Today, Frontiers North carries on that spirit of leading the way. Specially designed for the northern landscape, these all-terrain vehicles enable us to take guests to the best locations in the Churchill area to safely experience wildlife and the phenomenal northern lights. Venturing on a network of established trails in the Churchill Wildlife Management Area (summer and autumn) and the frozen tidal flats of Cape Churchill in Wapusk National Park (late autumn) the Tundra Buggy takes you to the best locations in Churchill to view and photograph wildlife. During the winter, we are the only company to travel across the frozen Churchill River, far from the lights of town, to our Thanadelthur Lounge to view the incredible northern lights. These are the best locations in the Churchill area to experience wildlife in their natural environment, and we hold the most permits in these protected areas. The official Tundra Buggy is about more than the vehicle; what makes a Tundra Buggy truly unique is where we get to go, the experience of our drivers, our passionate and dedicated tour leaders, and the opportunities for our multi-day package tour guests to spend time on the tundra with Field Ambassadors from Polar Bears International. 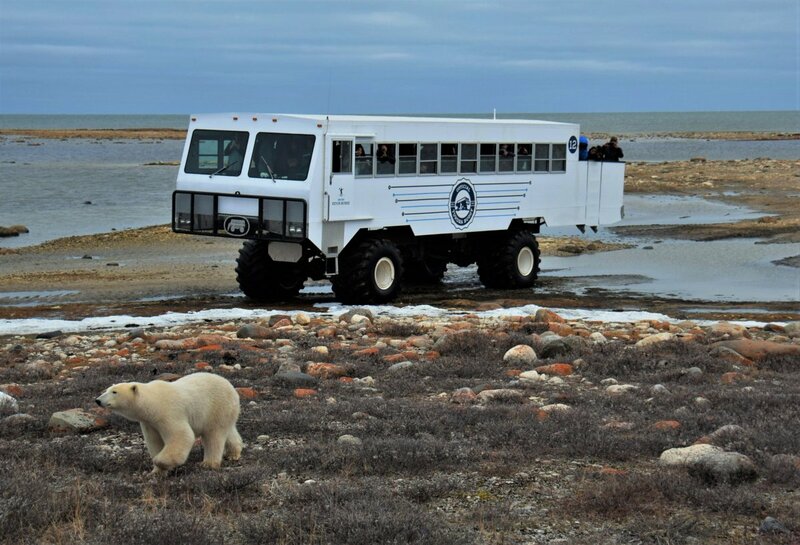 Frontiers North provides guests with a truly unique experience in some of Churchill’s most remote and exclusive areas. Venture into the Churchill Wildlife Management Area where polar bears roam. July and August - Take in the magnificent landscapes while you explore the Churchill Wildlife Management Area by official Tundra Buggy, witnessing a multitude of northern flora and fauna in their natural environment. October and November – Enjoy the beautiful colours of the autumn on the tundra in October, or visit in November to see the Hudson Bay Coast draped in ice and snow. Check out some of the Frequently Asked Questions about the Tundra Buggy!